Adalyn, my daughter, just turned 2 1/2 years old. She has been a great eater since birth and I know that I am super lucky. We have never had to deal with her refusing to eat like I know that many parents have but of course, we have dealt with some of the typical toddler issues such as throwing food, saying that she is done eating and then asking for a snack 2 seconds later, saying she doesn't like a food that she really does, etc. 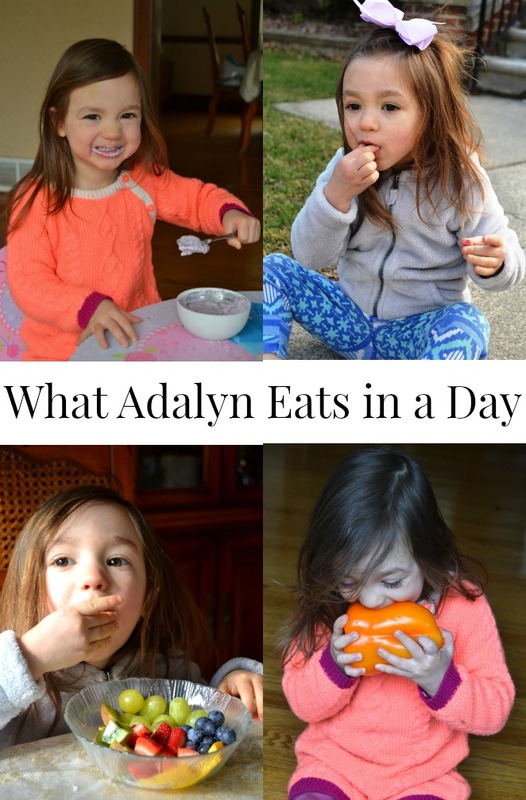 I wanted to share a "day in the life" post for fun to share what Adalyn eats in a day. For each meal, I will share a few options of what she would eat since no two days are exactly the same. We try to feed her a healthy, balanced diet rich in fruits and vegetables, whole-grains, protein and nutritious dairy products. We do allow treats but try to limit these. Breakfast is Adalyn's favorite meal of the day. She wakes up super happy and is excited for breakfast right away. Some days when I get her from her bed, she says "Mama, I wanna get up and eat breakfast!". Many times, I let her choose what she wants for breakfast since often times, I do not know what I feel like. Her and I have the same taste in breakfast foods so I usually just make myself whatever she is having. Adalyn absolutely LOVES her vitamins and it is her favorite part of the day. She asks me all day long to take her vitamins but we usually do them after dinner. Turkey, spinach and cheese Panini on whole-wheat bread, roasted sweet potato fries and a salad made with tomatoes, cucumber, red cabbage with a vinegar and oil dressing. Adalyn ate every last bite! Every night, we eat dinner as a family and we rarely have the same thing twice. I get bored of having the same foods quickly so I'm always coming up with new creations. I don’t know how to thank you.These information gave me a huge insight about parenting.